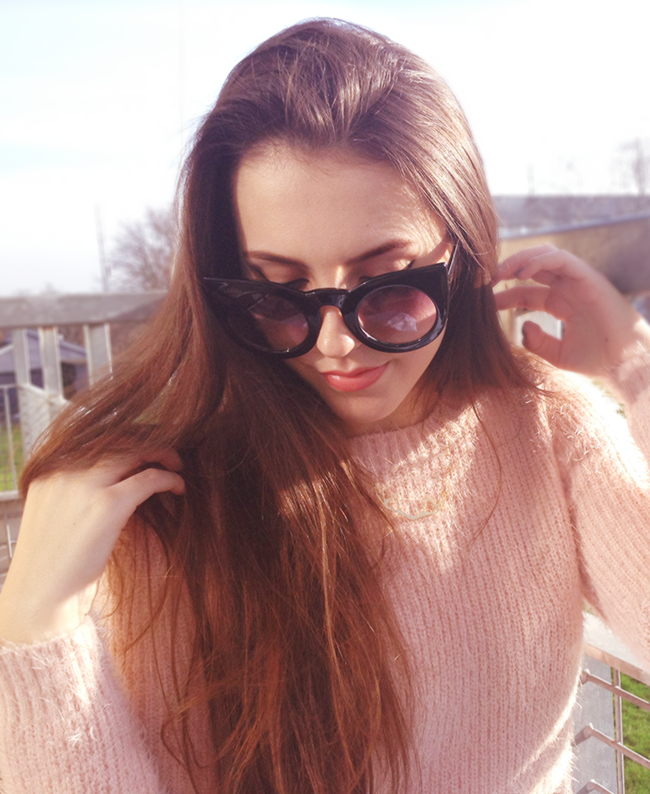 We're having such a beautiful Monday here, the sun is shining and it's so warm I didn't have a problem sitting in a balcony wearing just a sweater. God, it feels so good, seems like spring is really coming over. Even though 'winter pastels' was a big trend this year, the color palette still associates with spring, at least for me, and that is all I want to wear now, spring clothes! These two pastel garments are perfect for in-between winter and spring, the sweater is so fluffy and light but not too warm for spring, as well as the felt skirt, and I'm crazy about the pale blue color! As for the jewelry, all year round I'm into woodland theme, that's pretty much what all my jewelry is about. 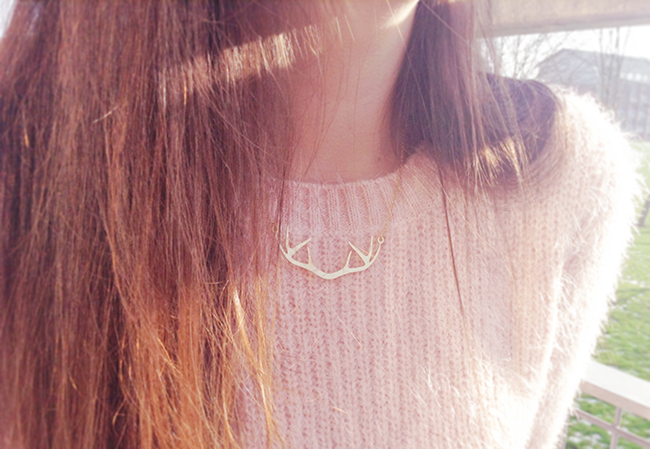 I love this antler necklace, it's delicate yet noticeable and that's perfect for me! I got it from Lulu May jewelry, and if you would like to purchase something, I have 15% discount code for you! It's RASA15, happy shopping! Lovely look, especially the shoes ! Sweet little outfit! You are adorable. Very chic combination. 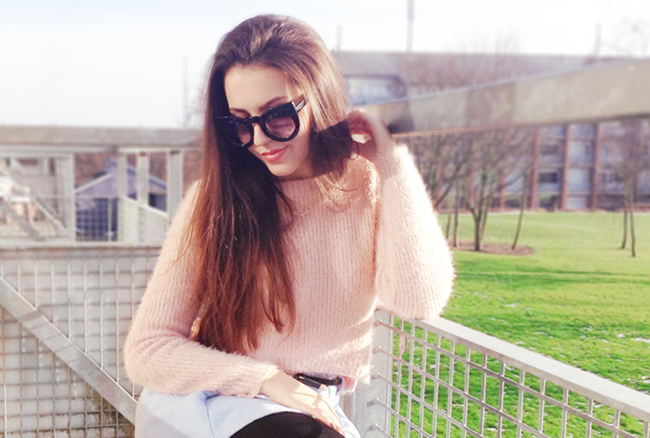 This pastel sweater looks great on you and I love your sunglasses and kitten flats. Simple and classy! Thanks for stopping by my page earlier! You look adorable! 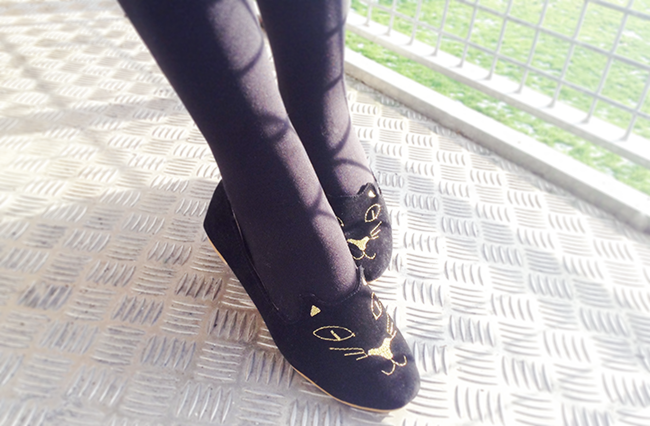 love the kitty shoes=) BTW those soy candles look amazing I would love to try one ! they don't have anything like that here in Arizona . I love the jumper and necklace. M.Mae. Love the color of your sweater!! One day last week it was so warm I swore Spring was coming. And then today it has snowed almost 7 inches, haha! Im inlove with your outfit! Everything in it is just perfect and cute. And I guess that you look fantastic! The sweater is so lovely!! Those sunglasses are beautiful! I love your sense of style. Following you now! I am in love with those sunglasses! they are so chic! Love this outfit! The shades are amazing! Very beautiful! <3 I'm in love with your blog. Would you like following each other? Let me know. Lovely look :-) Followed you! Thanks for your visit, I'm following you back! You look fab! Love that sweater on you, and those sunglasses are amazing!! I've followed back dear, thanks for dropping by my blog ;) stay beautiful! Precioso look en tonos pasteles, te queda muy bien. Such a cute outfit! Adore your style! Elegancia y buen gusto.Eres armonía de colores.Los zapatos me encantan.Te sigo y te invito a seguir mi blog.Saludos poéticos.